June | 2014 | ohdenny. 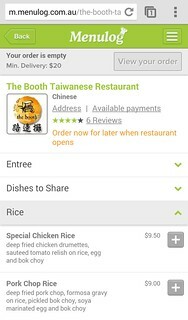 I’ve always been wanting to try The Booth but have always seemed to pick another restaurant in Box Hill, either by familiarity or just routine. On this occasion though, having been offered by Menulog to try their online ordering services, I thought it’s the perfect opportunity to give it a try. 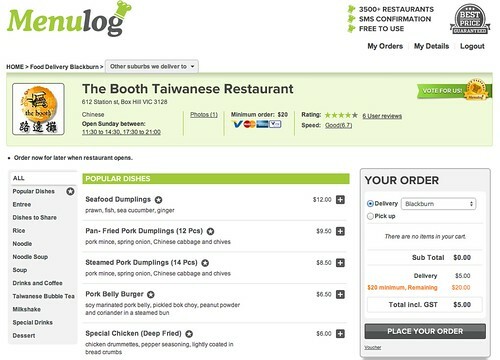 Menulog is currently the number 1 Australian website for online take-away and with over 3,500 restaurants on the website around Australia, it certainly makes a name for itself. My locality is in Blackburn so the restaurants offering pick up or delivery will vary. However, if you’re in the Blackburn area, you can check out the link to check out other restaurants using Menulog for convenient online ordering (Blackburn Take-away Restaurants). 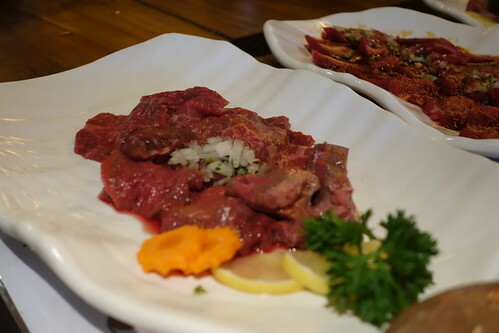 I find it’s a great away to find some restaurants that you may not have come across before, you visit Menulog and type in your suburb to check out the restaurants using Menulog in your area. Menulog is convenient and very straight forward to use, and for those tied to their smartphones (like myself), there is an app you can use too for iOS and Android (Link). But of course, the website and even their mobile website work well and easy enough to just pick what you want and order. As you can see from the screenshots, delivery isn’t too much for the sake of convenience but restaurants also do offer pick up too. Once you’ve chosen and paid for, you can schedule it for a preferred delivery time (or pick up) or “now”. 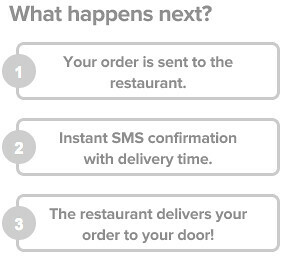 Then all you need to do wait for the SMS confirmation and either pick it up at the scheduled time or await delivery. Real simple. The food arrived on time and we were even provided with complimentary drinks, which is a definite winner in terms of service I must say. The food overall was still hot and no microwaving necessary. 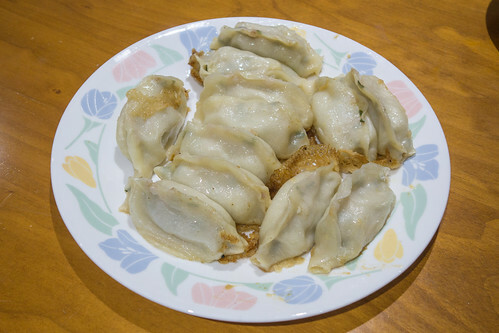 The Pan-Fried Pork dumplings were still hot and even a little crispy still, even with the steam softening some of it up as it would in a take-away container. 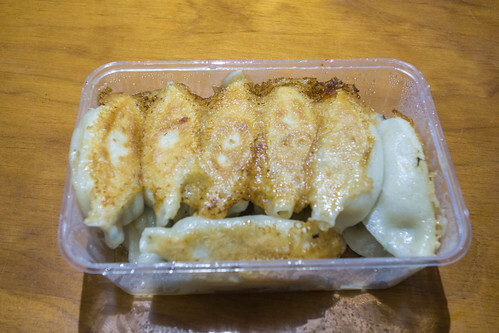 The dumplings are probably one of the better ones I’ve tried in Box Hill, it has just enough filling and the pork, ginger flavour comes through well. 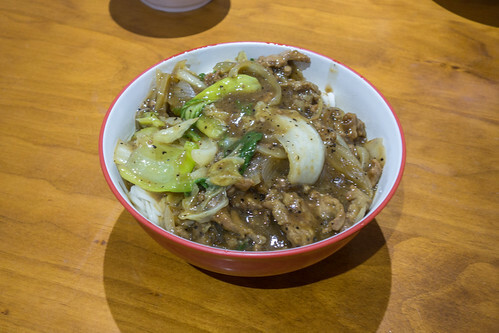 The Black Pepper Beef Noodles is fantastic too, the meal comes in two with the noodles in one container and the black pepper beef and sauce in another, all you need to do is mix it together. If you love pepper and beef, this dish is for you. The black pepper here is so flavourful, and the amount of pepper gives it a very nice spicy pepper kick. Pleasantly surprised. The Spicy and Sour Noodle Soup may not be for everyone, it is an acquired taste but since I have some familiarity with the sour and spicy soup, I quite enjoyed it. It’s a bit difficult to describe but if you have tasted Chinese Hot/Spicy and Sour soup before you’ll instantly know this, and I believe the sourness comes from Chinese vinegar that they add. Tasty dish but I could do without the abundance of mushrooms. The Booth’s Sweet Soya Bean Curd with Mango, Sago & Coconut Milk is really wonderful. I would have preferred if it were a cold dessert as it was only slightly cold/room temperature but I guess I could always add ice to it or chill it for a few hours. 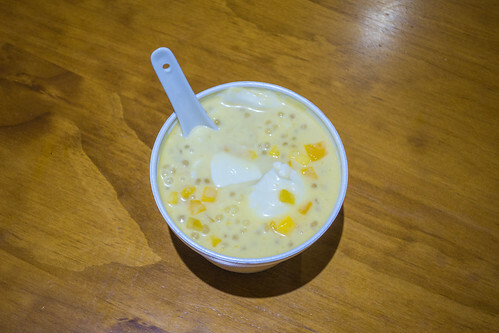 The dessert is quite similar to a Tofu Fah/Dau Fu Fa in texture but with the Soy Bean curd isn’t as smooth as tofu is but alas with the coconut milk and mango, sago makes for a really tasty dessert. The creaminess of the coconut milk and the sweetness of the mango gives it life. Would definitely order this again. 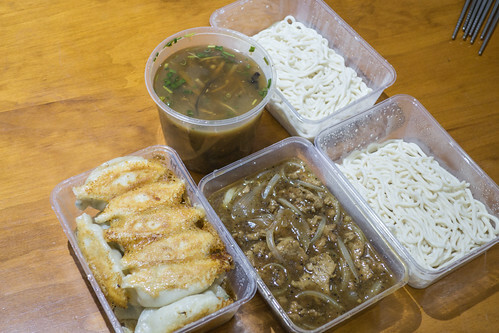 I’m very glad to have ordered from The Booth, from it’s great service and tasty food I think you can definitely rely on them for a great take-away night. 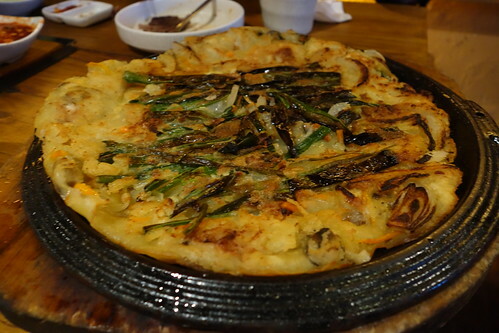 Overall, I couldn’t really fault the dishes other than its generous use of oil. I recommend giving it a try in-restaurant or ordering from Menulog as if you’re local it’s only $5 to Blackburn which I found to be very reasonable, and the food at The Booth certainly won’t break the bank either. 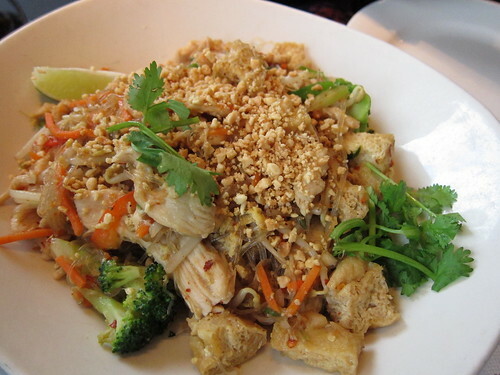 Toronto has exceptional Thai food. I’m not sure why as seemingly they are a fair distance away from Thailand and seemingly there isn’t a significant community of sorts but alas somehow Thai cuisine thrives here. Salad King is situated not far from the Ryerson University, which results in the restaurant filling up quickly during peak times. What is also interesting, that I’ve never seen in any restaurant before (other than a Nando’s) is a Spicy Scale as shown below. My sister having dined here before, recommended 3-5 Chilis, and even those were quite spicy so I’m not entirely sure how 20 Chilis tasted like. Maybe like a fireball in your mouth and stomach? Salad King’s Phud Thai (or Pad Thai) is light and fresh in flavour, fragrant and overall a very delicious dish with the spiciness adding a nice touch. 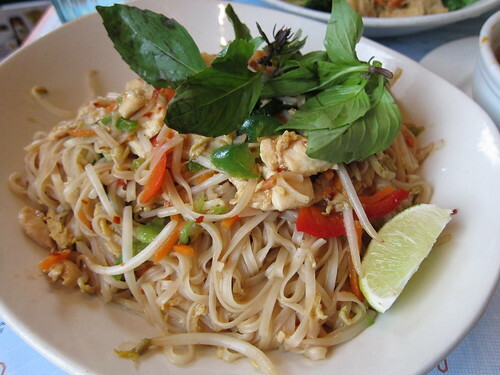 It’s not the best Pad Thai I’ve ever eaten but definitely above average. The Bangkok Stir Fry is unfamiliar to be but I loved the peanuts added on top with the rice vermicelli (clear noodles) which are property my favourite styled stir fried noodles if done right. Tasty dish. 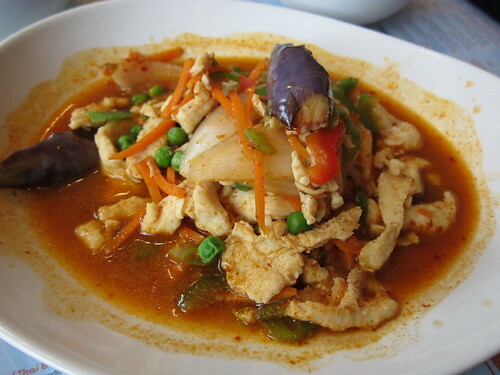 The Rainbow Chicken is another interesting Thai dish, with eggplant, capsicums and the combination of basil, lemon grass and chilli sauce makes quite a great dish with some white rice. Cheap and tasty. 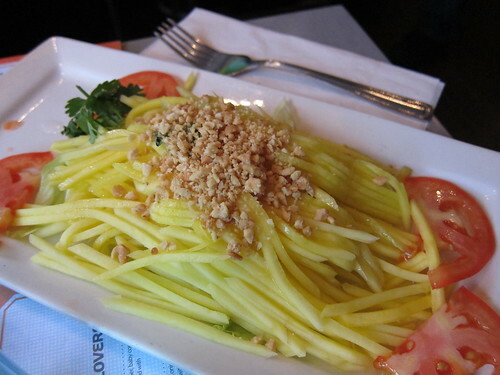 The Green Mango Salad with mango strips, tomato, lettuce and dressed with chopped peanuts and a Thai dressing (made from fish sauce, lime juice, peanuts and sugar) is refreshing but not particularly my favourite kind of salad. 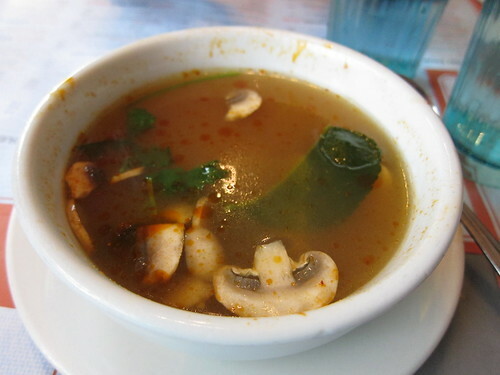 Salad King’s Tom Yum is another winner, with the perfect combination of sweet and sour and of course spice and really just want you need on a cold day (which was nearly everyday in Toronto). Cheap and tasty Thai food is what I’d describe Salad King in a few words. If I were to compare Salad King to Khao San Road, tastewise Khao San Road comes out on top, the dishes there just blew me away. Although in terms of price, you may prefer Salad King over Khao San Road but flavour cannot be denied in my humble opinion. However, both are probably for different occasions and settings so in someways aren’t very comparable. Salad King definitely earns its title as Toronto’s favourite Thai. In the Box Hill hub, there are quite a few Vietnamese restaurants on Carrington Street. Indochine is probably the largest and most popular one,. I’ve tried Indochine, and couldn’t understand the appeal, so off to the next one on the street. 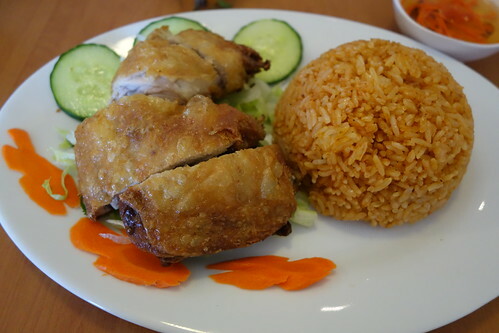 Tan Tan is just a few doors down from Indochine and now being so far away from Springvale, I’ve still yet to find a great Crispy Chicken with Tomato Rice dish, so for every new Vietnamese restaurant I try, I always seek out this dish which has yet to be topped. 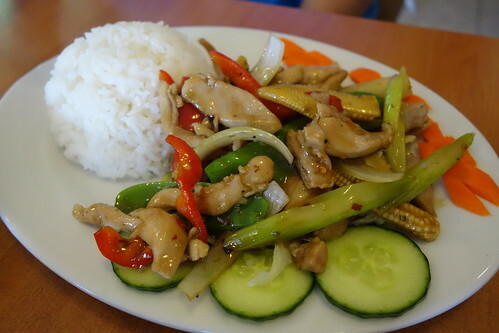 The Lemongrass Chicken and Stir Fry with Rice, is an especially fragrant dish with the lemongrass but again, nothing really stood out. The chicken cooked well, and the capsicum adds depth of flavour, apart from that it could be a little forgettable. 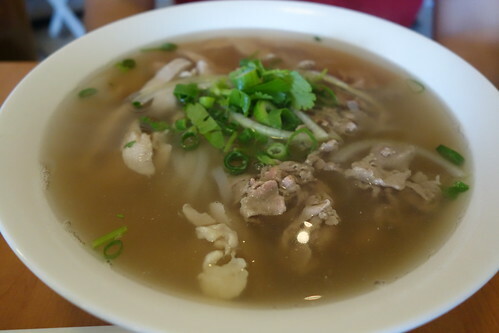 Beef and Chicken Combination Pho is a staple at every Vietnamese restaurant, however the soup here isn’t too flash. 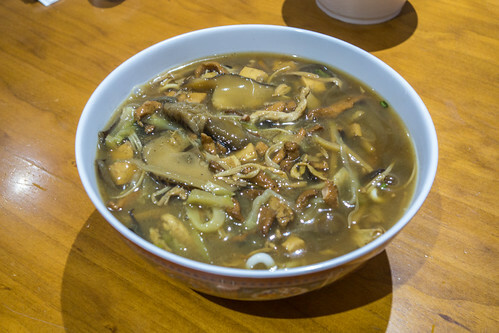 Lacking in flavour as compared with the popular and local favourite Pho places such as I Love Pho 264 in Richmond, and Pho Hung Vuong in Springvale. The soup is the star of a Pho dish so it’s disappointing that it is very average here. I can’t say that I found Tan Tan to be memorable for its dishes which I really did hope it would be. One of the pluses was that the staff were very friendly, and the dishes weren’t too expensive but I’m not too sure that would be enough to get me to go back there again for sometime. 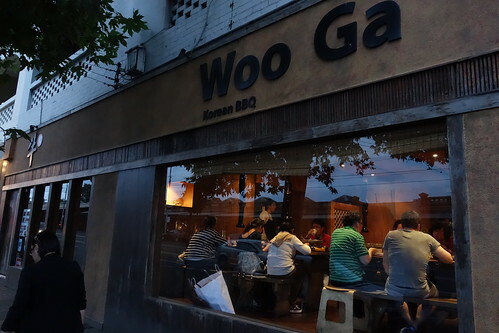 Woo Ga Korean BBQ Restaurant is situated on Victoria St, North Melbourne, quite close by to the Queen Victoria Market and along a stretch of a few Korean restaurants. 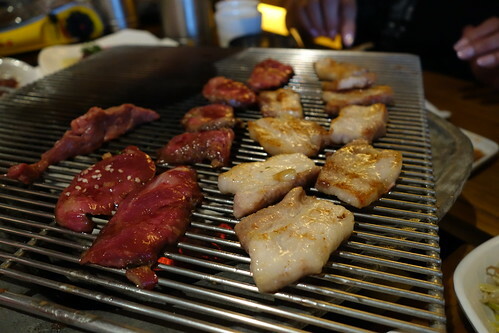 Korean BBQ restaurants are aplenty in Melbourne and I’ve mentioned ChangGo previously which is probably one of the most popular Korean eateries in the CBD. 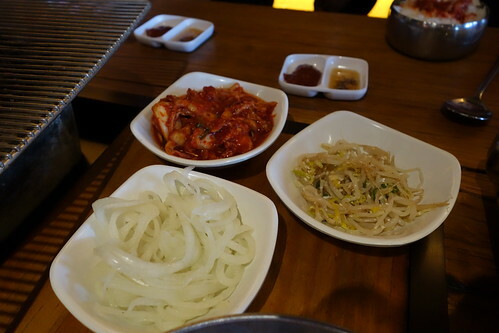 We ordered the Combo B which is for 3-4 people/serves ($68) which comes with the pickled onions, bean sprouts and kimchi as starters. 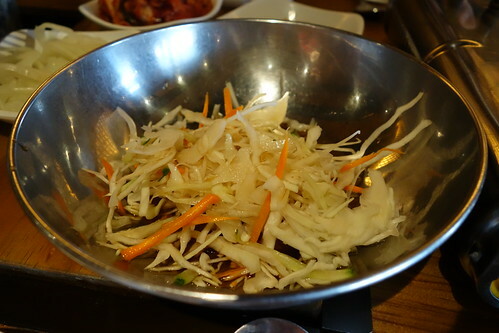 The sweet onions are really nice and flavourful, I’m not sure what they use to marinate it but it’s very refreshing. Combo B is beef heavy, and it comes with Premium Wagyu Chuck Eye Roll, “Top Grade” Beef Rib, marinated Beef Flank, Beef seasoned with salt and pepper and lastly Kimchi & Pork Spicy Soup. The cabbage and carrots salad is super crunchy, and it has a light dressing that adds some flavour to it too. Combo B is all beef so those that may not be so fond of everything beef, you may opt for some pork as extra. 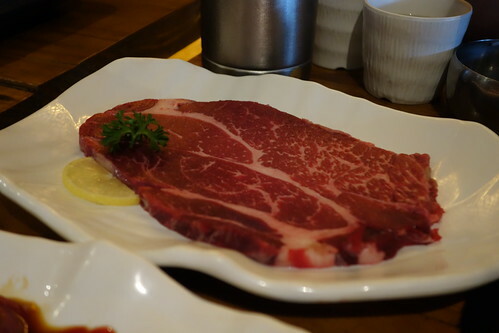 The beef is very tender and can cook very quickly once it’s on the heat, so be aware to move it away or turn it over so the beef isn’t overcooked. It’s like your very own cooking class. 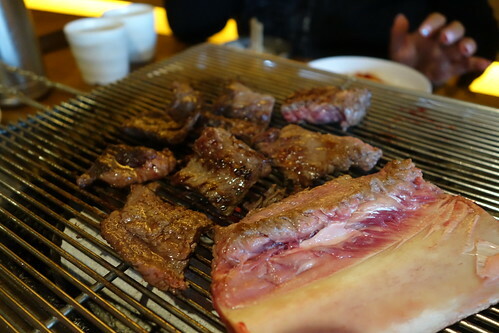 Most of the cooking is DIY and the staff do switch the hot plates for different cuts of meat but I found it took longer for the meat to cook as it had to keep heating up the room temperature plates. 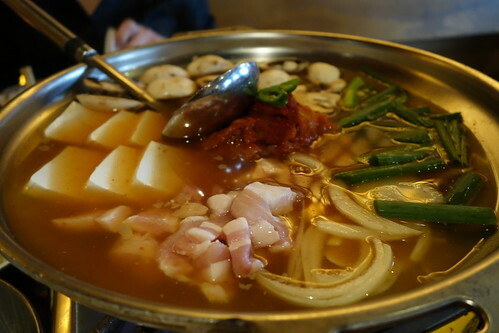 The Spicy Kimchi and Pork soup was again delicious with fresh mushrooms, spring onions, mushrooms and soft tofu. 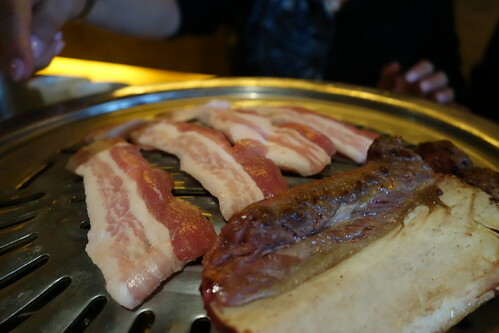 Woo Ga does Korean food well but on a busy night, service may be a bit lacking as we had to request some things twice or it took quite a while for them to get back to us which does leave you a bit disappointed even if the food is great. I found ChangGo to be the better one of the two, better tasting soup and meat (although I am comparing beef to pork) and similar chaotic service.